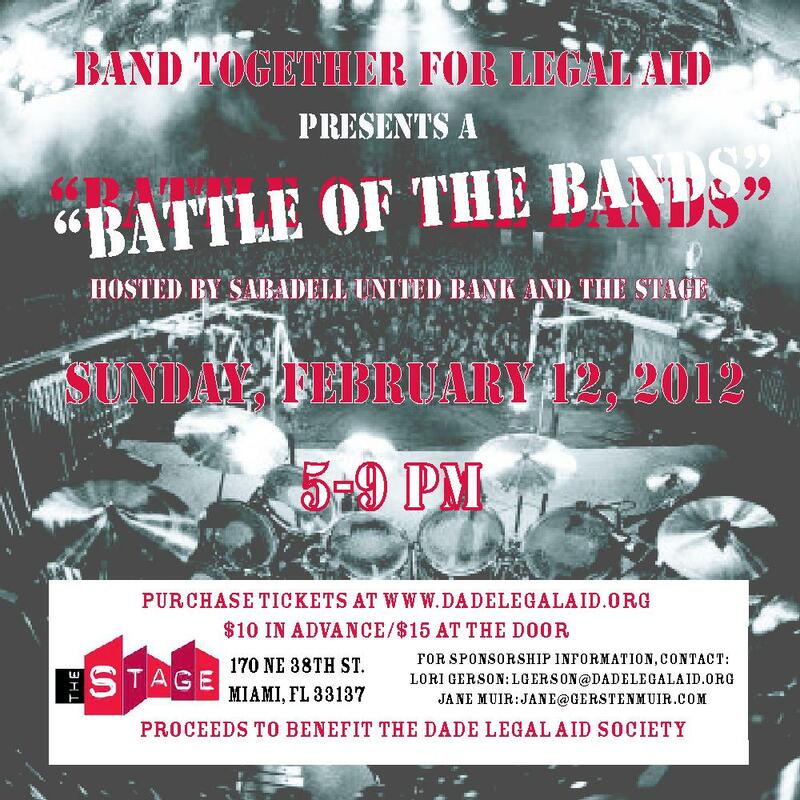 Band Together for Legal Aid will host its first annual Battle of the Bands, kicking off Dade Legal Aid’s fundraising efforts for 2012. The event will showcase live music from groups featuring prominent lawyers from South Florida on Sunday, February 12th. The event will be held at The Stage, a unique music venue located in Miami’s Design District. The Stage was voted 2011’s Best New Venue for Live Music by The New Times. Band Together for Legal Aid is composed of some of South Florida’s finest young professionals who are committed to ensuring that lack of financial resources is not a barrier to equal justice under the law. Chaired by Jane Muir, a local attorney, the committee expects to bring together more than 300 supporters to raise much-needed funds for Dade Legal Aid. Guests will enjoy live music, drink specials and hors d’oeuvres from local restaurants. Proceeds from the event will enable Dade Legal Aid to continue its mission of providing free legal services to qualifying low income residents of Miami-Dade County. A non-profit law firm in practice for over 60 years, Legal Aid has two components: in-house legal services and the Put Something Back pro bono program. The 21 staff attorneys specialize in family law, domestic violence, guardianship, child advocacy, housing, bankruptcy and foreclosure, with priority given to the protection of children. 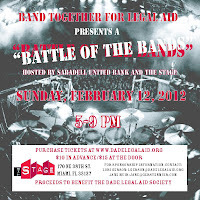 Tickets for the Battle of the Bands can be purchased online at www.dadelegalaid.org. Advance tickets are $10, and can also be purchased for $15 at the door. Please visit www.dadelegalaid.org for additional information and remaining sponsorship opportunities. This definitely one of my favorite venue. I love watching battle of the bands and rocks with them.